The night turned out delightfully, with perfect weather, a crowd half plain clothes and half steampunk, and fantastic performers. It was great to see all the entertainers meeting each other and sharing thoughts, ideas and skills. The evening started off at The “Old” Yellow Cab Building with the doors opening at 6PM and the food truck, Flour Power Wood Fired Pizza, pulling into the lot. In the entry Kitty Kim had artwork for sale and was decorating hands with custom Kittie entry hand art with the help of Lauren & Gintia. 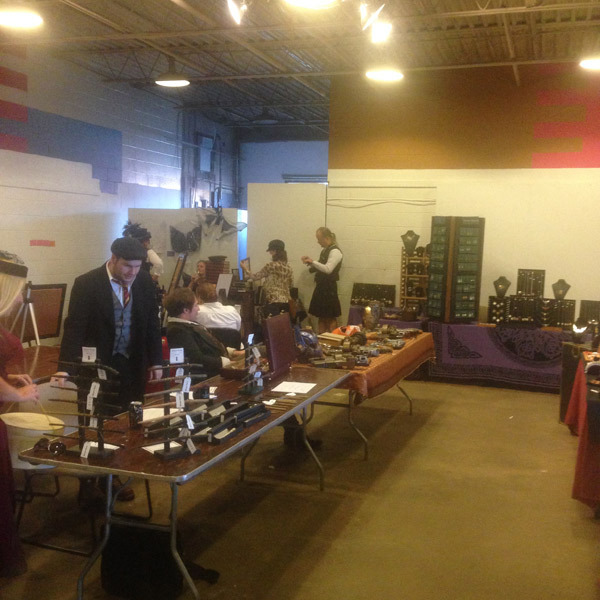 The crowd flowed easily between the outdoor tables and chatting space, the big performance room that was open to the outdoors, and the adjoining vendor space. 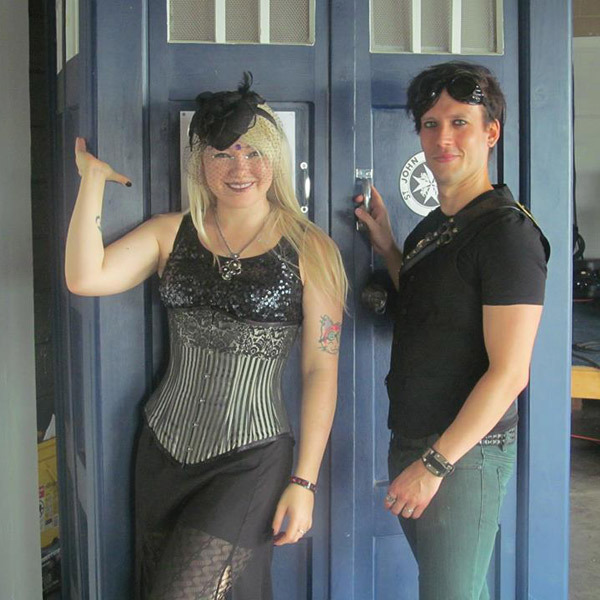 Also, I cannot forget to mention the wonderful full scale TARDIS complete with lights and sound created by the very talented Micheal Kilbourne. 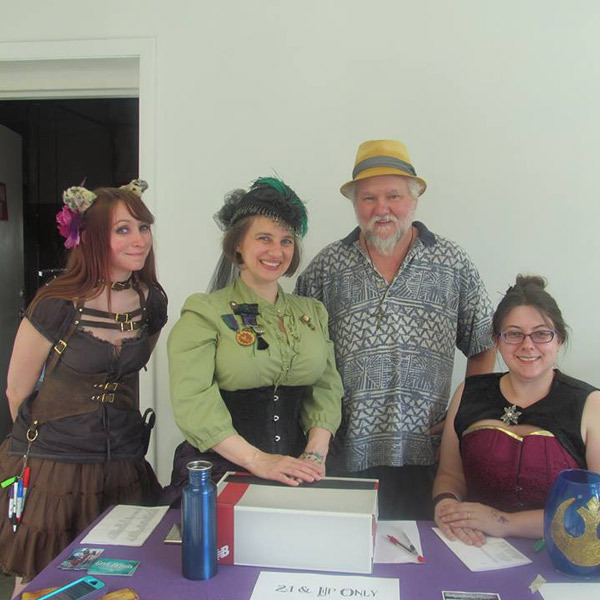 The vendor room was packed with: Free Pirates for Hire! – Cosgrave Studios – Lady Red’s Emporium – Sew Late at Night – Ollivanders Wands – Mayhem Market – The Pandora Society – Sylvan Creations – and more artwork by Jacobee Rose Buchanan. 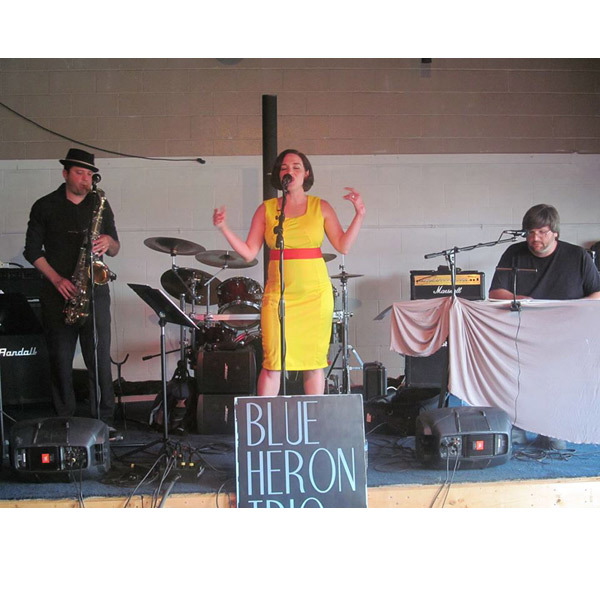 First up on the big stage next to the TARDIS was Dayton’s Blue Heron Trio playing their jazz / pop stylings consisting of vocals, sax & keyboard. 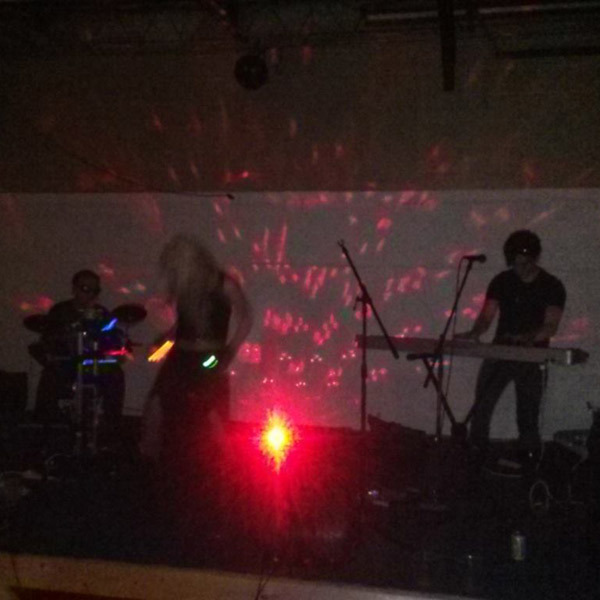 Their set was very well received especially their 30′s versions of popular 80′s songs. After a short break the Blue Moon Circus arrived on stage. Coming all the way from Lousiville, KY we were treated to the sights, sounds and skills of seven amazing performers. 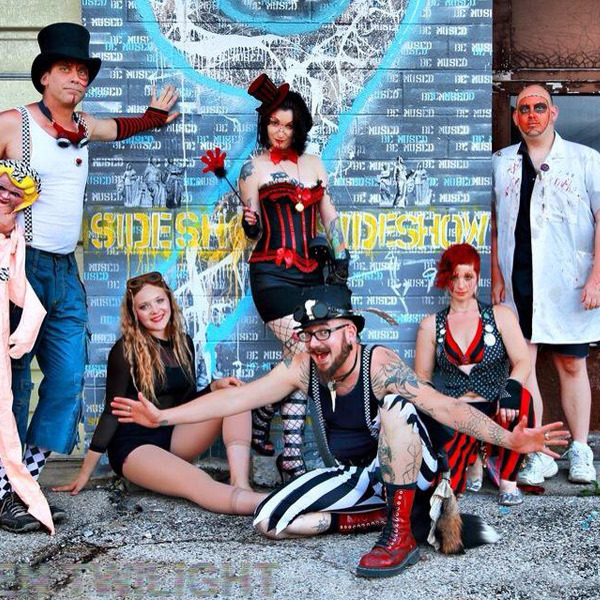 The ringmaster called on them to display their skills with unicycle riding, fire eating, fire breathing, glass walking, stilt walking, contortion and so much more!!! 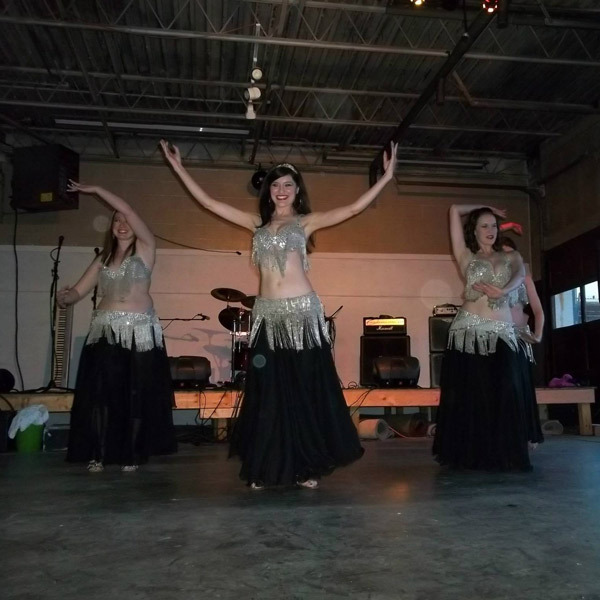 With just enough time for everybody to catch their breath, out glided four breath-taking bellydancers from Bronwen Bellydancing. The assembled were mesmerized by their control, love of dancing, and crowd engagement; and yours truly was even brought out to finish off a bit of a dance with the ladies. 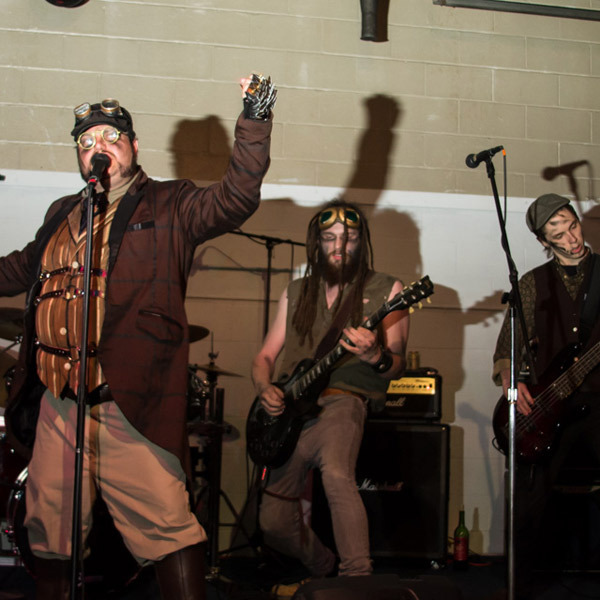 Next up, metal steampunk band Automaton took to the stage with a roar that didn’t let up their whole set, which concluded with a debut of a new song. During their set the friendly boys in blue paid a visit to make sure everything was operating properly and after a quick walk through they were satisfied and on their way. 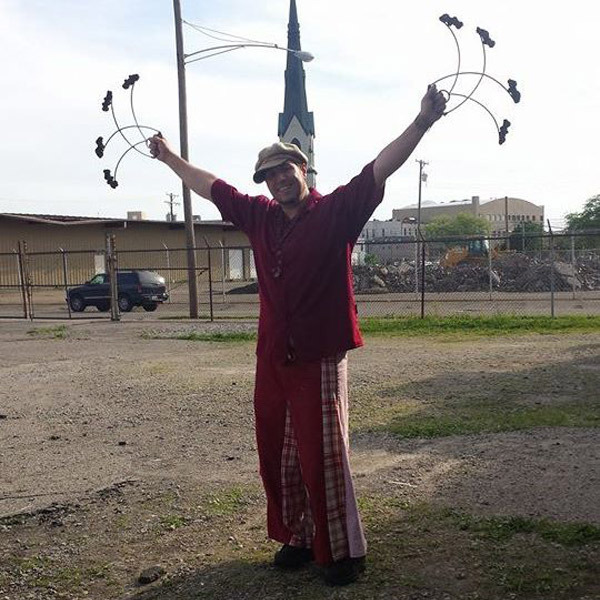 After the hot set of music everybody was ushered outside to see the amazing fire dancing of DaShane Starfox who lit up the sky with his skills. 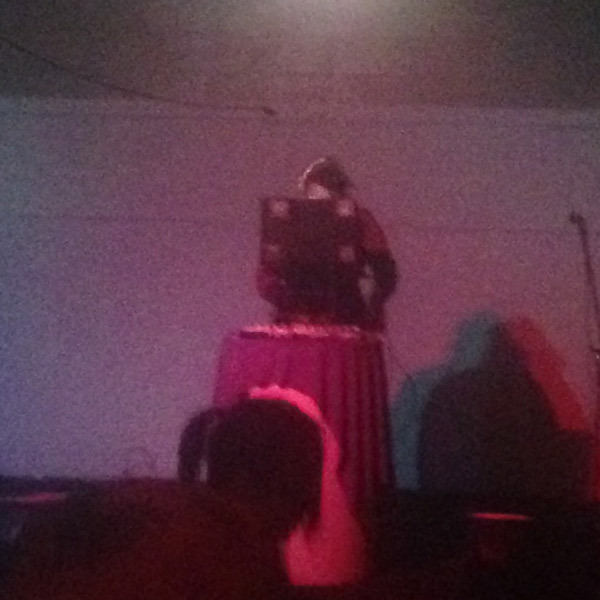 Then the stage lights went down and goth electronica filled the air as Curse of Cassandra took control of the show. The crowd danced as long as they would play. Finally, the night was finished off by the skilled spinning of DJ V-Ral who kept the beats going and the late night crowd dancing until 2AM.